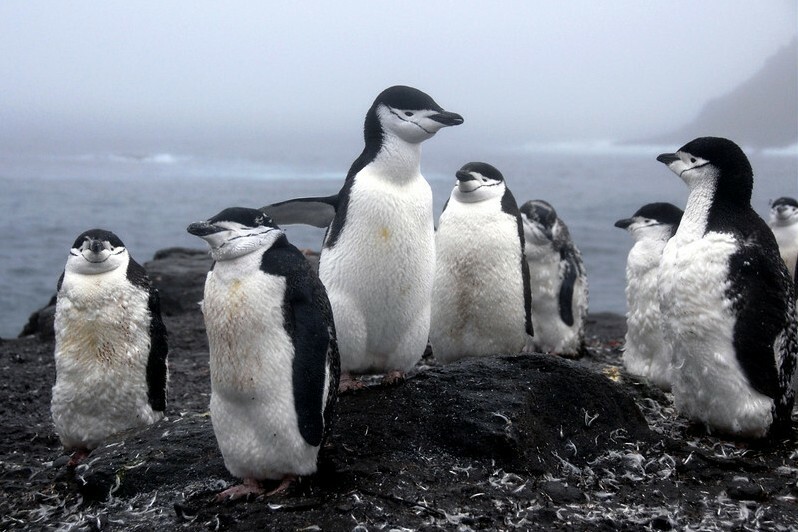 The Antarctic is the highest, driest, windiest and coldest of the seven continents. Few have seen this remote, desolate land. Even fewer have scuba dived its frigid waters, but diving Antarctica can be the experience of a lifetime. Getting there is a challenge. Normally, departure is from New Zealand, Chile or Argentina (Ushuaia). Crossing the Drake Passage, which takes about 2 days, can be challenging, as the seas are notoriously rough and swells sometimes exceed 20 to 40 feet. There is no “typical” dive, except all are cold. Deception Island is a good site for a first practice dive since this ring island is actually the remains of a volcano that collapsed, forming a huge caldera which flooded with water and is accessed by a narrow inlet called Neptune’s Bellows. For centuries, whalers used this natural haven to conduct whaling operations, though fortunately it is now abandoned for such use. Here is a short list of major dive sites, along the East Antarctic peninsula. Whaler’s Bay, inside Deception Island: Various brittle stars, urchins and limpets abound. Gouldier: Expect to see some nudibranchs, multitudes of isopods, some cryptic fish, anemones and an occasional leopard seals. 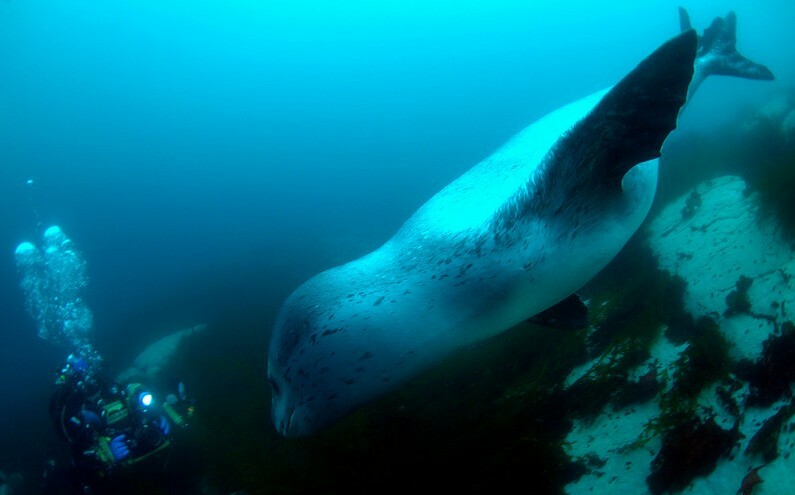 Leopard seal and diver Kevin Lee, photo by Jeff Bozanic. Note from the editor (Scott) - "What a dramatic moment! That leopard seal looks huge. I could imagine the feeling Kevin had when that huge Leopard seal checked him out. Kevin told me the Leopard seal was curious and came by several times". Palmer Station: Scientists from this USA research station are friendly and often make presentations to visitors. 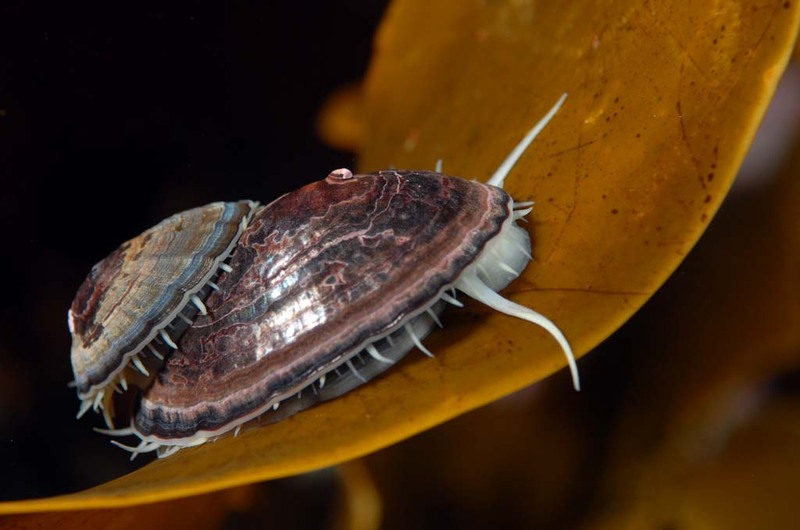 Underwater, there are plenty of gastropods, limpets, tunicates, stars and bryozoans. You are apt to get buzzed by penguins. Bahia Wreck: Not far from Palmer station, the wreck of the Bahia Paraiso, which hit a shallow reef and sank, in 1989, becoming the worst maritime disaster in the Southern Hemisphere. At low tide one can actually stand on the hull; the deepest end goes to about 70 fsw. The wreck is a haven for limpets, sponges, tunicates and kelp. Detaille Island: Numerous icebergs offer interesting diving. Sometimes the bottom of the berg explodes against the rocky bottom, sending a showing of ice chunks upwards, which need to be dodged, lest a dinner sized piece dislodges a mask or reg. Surface textures of the ice are very interesting. Remember that buoyancy characteristics can change abruptly as melting fresh water runs into different density sea saltwater. Also, as a berg melts, its center of gravity shifts and the entire block of ice can suddenly move, even turn over, causing dangerous eddies and whirlpools. Verdansky Station: This Ukrainian research station, which originally detected the ozone hole, was purchased from the Brits, for a token one pound. A visit is a must, as home-made vodka is sold or traded for brassieres (these adorn the bar), left behind by female visitors of various cup sizes! Many penguins reside here. 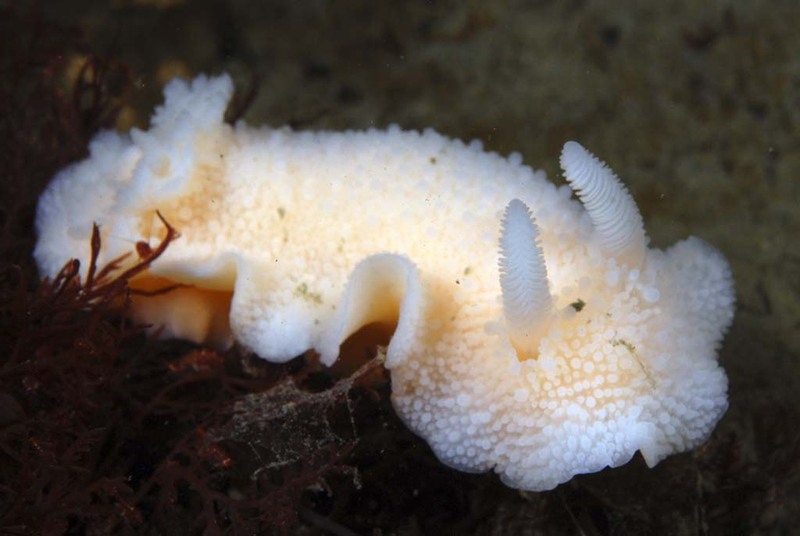 Sea slugs are not uncommon, along with sponges, amphipods and worms. Peterman Island: Leopard seals are seen here regularly while diving Antarctica. These sinister looking animals are at the top of the food chain; however, they are more curious than aggressive. The author was buzzed numerous times, underwater, and his dry suit stayed dry inside. 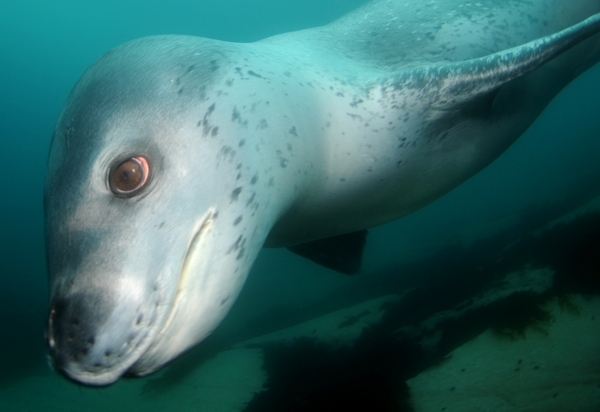 The only known human death by a leopard seal was in 2003, when a British scientist, Kirsty Brown, was attacked, while snorkeling, and dragged, as her dive watch later revealed, to a depth of more than 200 feet. 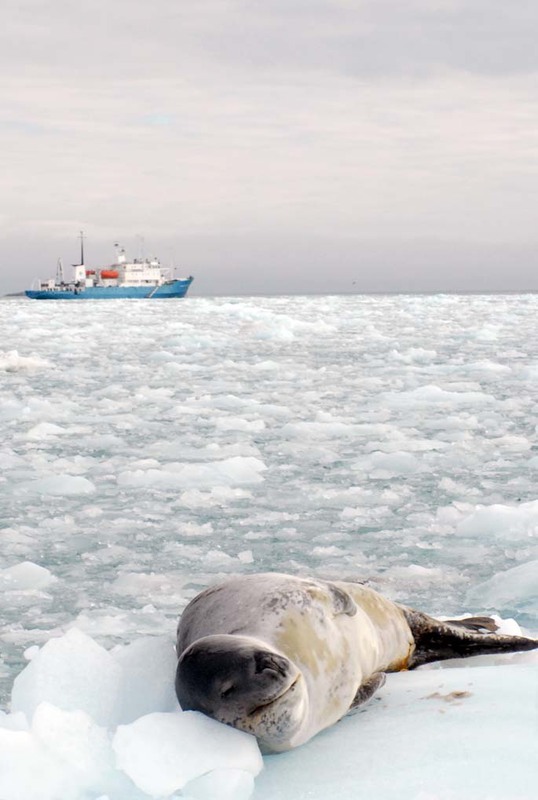 It is thought that she might have been mistaken for a smaller seal or penguin by the leopard seal. 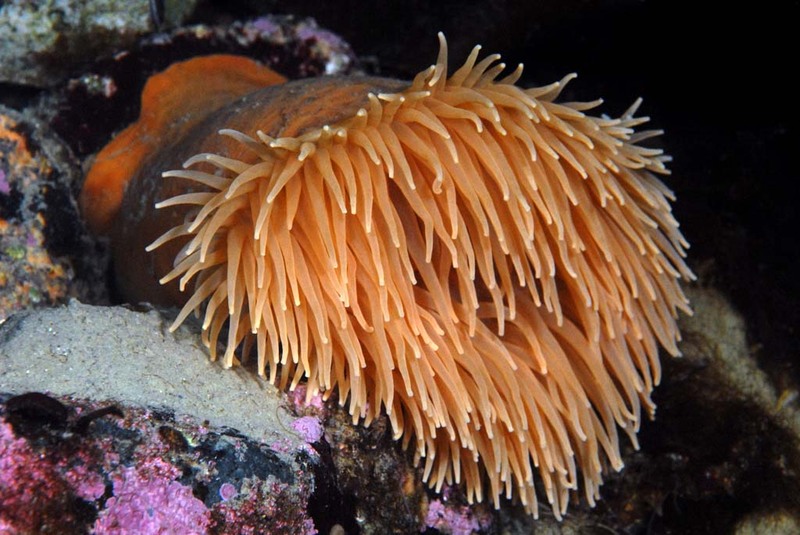 Paradise Bay: Worms, limpets, stars and amphipods in a wide range of sizes and colors. Small fish are occasionally seen. 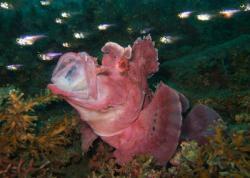 Danco Island: Plenty of sea cucumbers, stars and huge worms (the author saw some 8 feet long). The author used a Nikon D200, with 60mm macro lens and 1.4x tele-converter which worked well for macro shots. 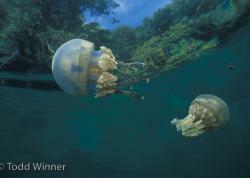 Visibility was generally good enough for wide-angle underwater photography, though macro opportunities are more prevalent. A Sea & Sea housing was used, with dual YS-110 strobes. Some think camera gear should be kept outside to minimize condensation. This is not necessary and the author does not recommend this. The air is so arid condensation is not a problem, as long as there is good ventilation inside your room. After each dive, change batteries in both the camera and strobes, as batteries have significantly shorter lives in cold temperatures. Dry gloves are best, with medium inner gloves, providing enough dexterity to operate housing buttons. Google “Antarctic Scuba Diving” for a list of adventure dive companies that can help book your adventure. The author had a positive experience with Ocean Expeditions. Diving is normally done on the East Antarctic Peninsula, as the waters between the many islets are well protected and therefore calm. Summertime is the best time to dive Antarctica, which equates to November to March in the northern hemisphere. Expect water temps to range between 28 and 34 degrees Fahrenheit. Due to the high salinity of the water, the sea water remains in a liquid state below “freezing”. Early in the season, prior to the plankton blooms, water can be crystal clear, with visibility measured in hundreds of feet. 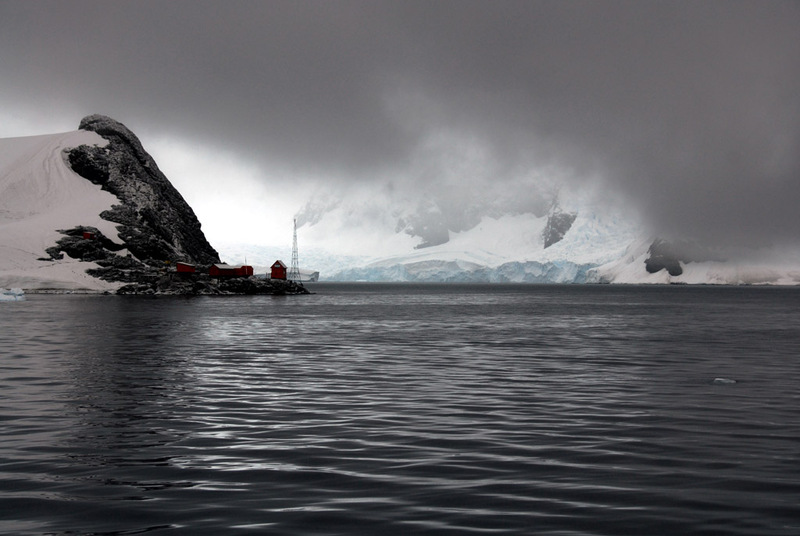 During the late Antarctic summer, in March, the author experienced 40-80 feet of vis. Surface temps ranged from the mid 30’s during the day to the 20’s at night. 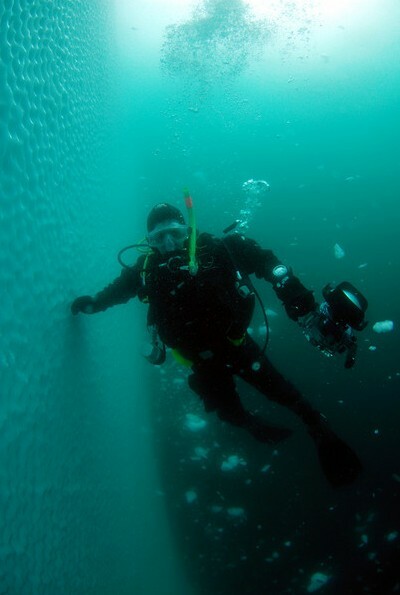 Diver and chunks of ice, underwater in Antarctica. The ice chunks were actually flowing UP towards the surface, as the iceberg struck the ocean floor below.